Malware of the file encryption character also known as ransomware has been causing quite the stir and it is no secret that the encryption these threats use may take tens if not hundreds of years to factorize and decrypt files unless a key is discovered or there is a bug in the malware itself. This was the case with these “fallen” ransomware viruses which can now be decrypted for free. 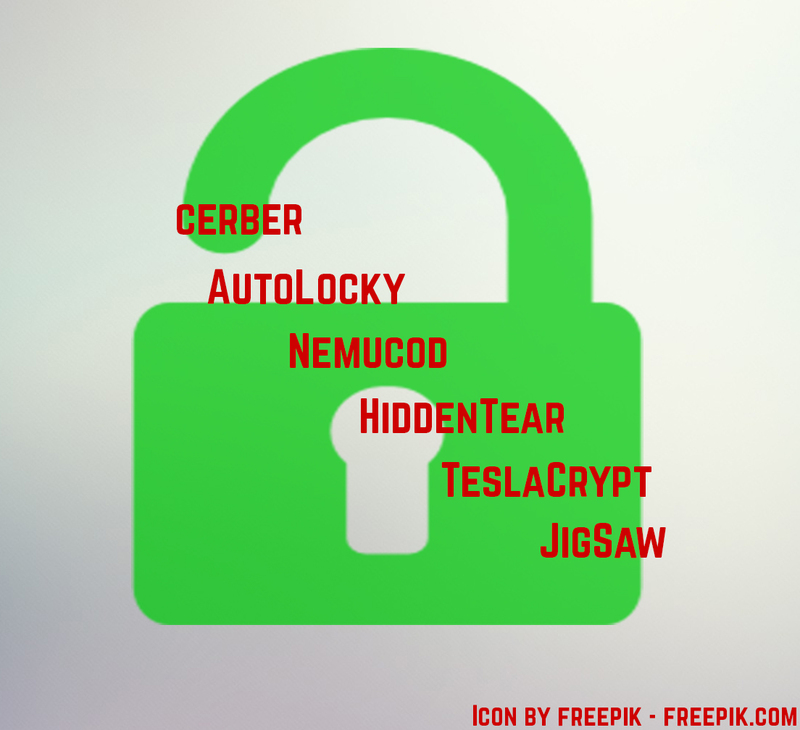 In this article, we are going to display to you the latest viruses that are available for free decryption and If you find the virus that has attacked your device, we urge you to click on the decryption instructions in the red squares underneath it. We have also included a quick background of the viruses themselves to help you better identify them. Let’s begin! Update! Decrypters for more viruses have been released. More information in the following article. A very nasty crypto-virus that was distributed via malicious URLs and file attachments via spammed and phishing e-mails. The first version of the virus, now decryptable requests from users to pay the sum of approximately 500 US dollars in BTC in order for its decryption service. The Cerber virus has also been the reasons of reports by users from all over the world for massive infections. It is using an extremely strong AES encryption algorithm to encrypt files. As soon as the decryptor for this virus was released, researchers have established that a second variant, named Cerber 2 has come out to infect and encrypt at the same if not higher rate. The Jigsaw ransomware was first detected around the beginning of April and it is as twisted as the movie Jigsaw is, threatening to delete files on every hour to “motivate” its victims to pay the ransom money. The virus supports over 120 types of file extensions which it encrypts after which locks the screen of the infected machine. Later on, many variants of this virus came out, suggesting it was sold as a service (RaaS) in the Deep Web. Fortunately, a decryptor has been released for the JigSaw ransomware, instructions for which you can find in the red frame below. As soon as the AutoLocky variant started infecting users, it immediately became evident that this type of malware aims to copy the big fish in ransomware – Locky ransomware. It even uses Locky’s ransom note as well as its file extension – .locky. The virus demands 0.75 BTC as a ransom payoff from users, but luckily, now there is a decryption available. As a bottom line, we advise users that have been infected with these viruses carefully to follow the tailor-made instructions in the decryption manuals to successfully salvage their files. More importantly, we recommend focusing on protection rather than trying to restore your files because you may be lucky at this moment since a decryption is available, but there are many ransomware viruses out there whose files cannot be successfully decoded. Hey !, I found this information for you: "Decrypt Files Encrypted by Ransomware Viruses Part 1". Here is the website link: https://sensorstechforum.com/decrypt-files-encrypted-ransomware-viruses-part-1/. Thank you.